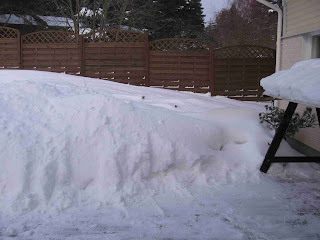 This is the winter holiday (talviloma) week here in Finland and is traditionally the coldest week of the year. In the past few years this has not been the case but this year this has come back with a vengeance. We have had temperatures of minus 17°C for the past few days and more of the same is expected for the coming week. Along with the cold temperatures has come some more snow. We had already quite a lot and are now struggling to find a place to put it all. 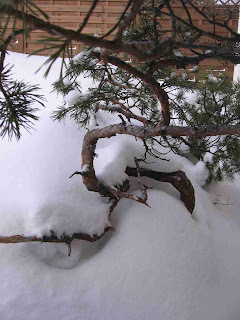 At least the more snow helps to cover my Pine trees. I have not completely covered them because they are also positioned close to my house, even though I could easy do so with the amount of snow that we have had. 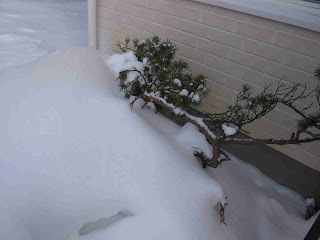 The deciduous trees are still in my garage on the heater bed. I have had this on a couple of times to relieve the temperature a little, but the good thing is that the garage is keeping the temperature some 8-10°C warmer than the outside temperature. 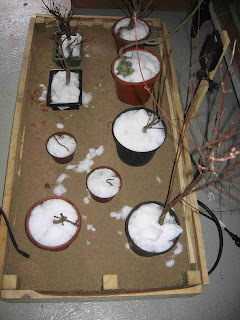 As you can see I have placed some snow on the pots which will slowly melt into the soil to prevent the soil from drying out.